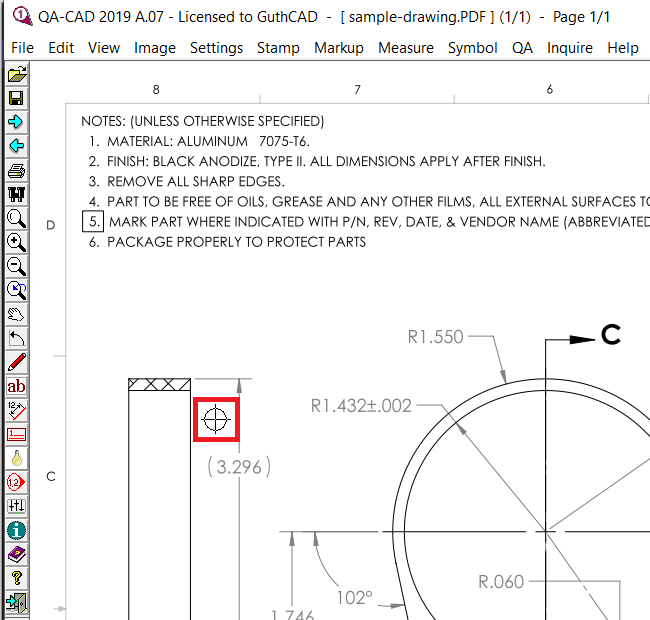 QA-CAD is a quick, easy and lowest priced PPAP (Production part approval process) Software with one-time fee for perpetual license! 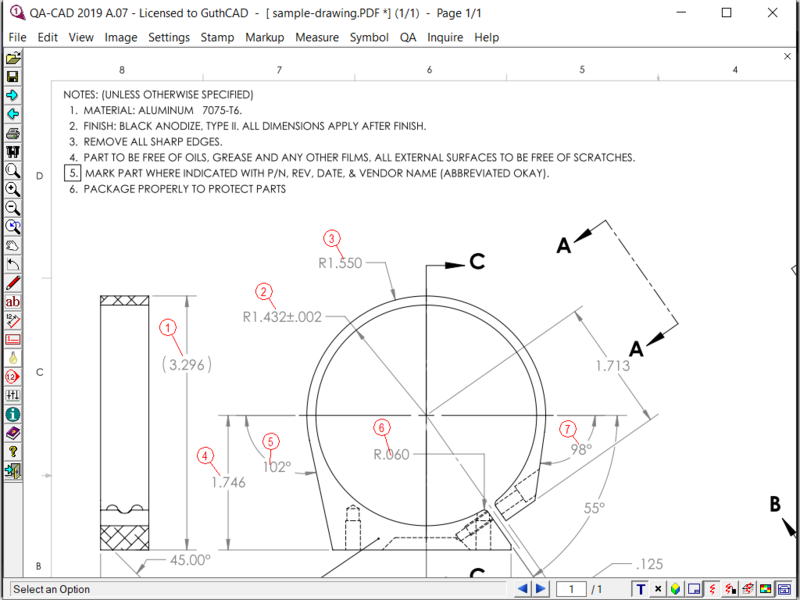 QA-CAD completes PPAP forms quickly and accurately to capture dimension, tolerance, GD&T, text and zone automatically from PDF/CAD drawing. 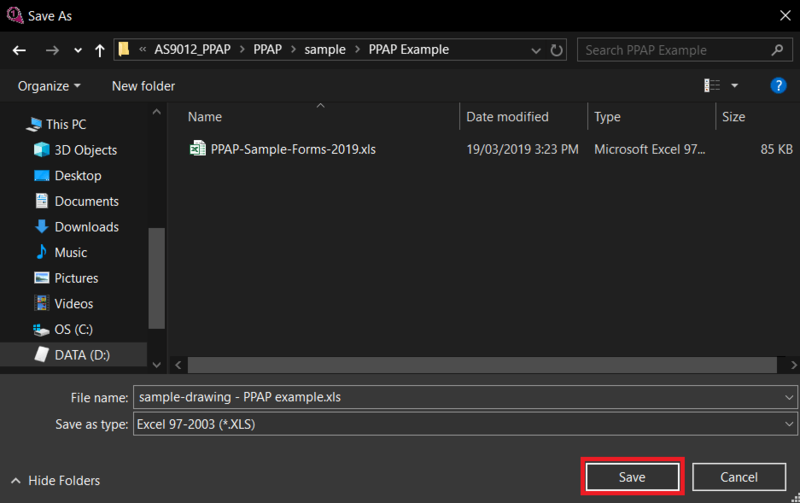 This tutorial video shows how easily you can complete a PPAP EXCEL form file by capturing text from a sample PDF drawing with our PPAP software. (In this video, our sample PPAP forms file is used as example). 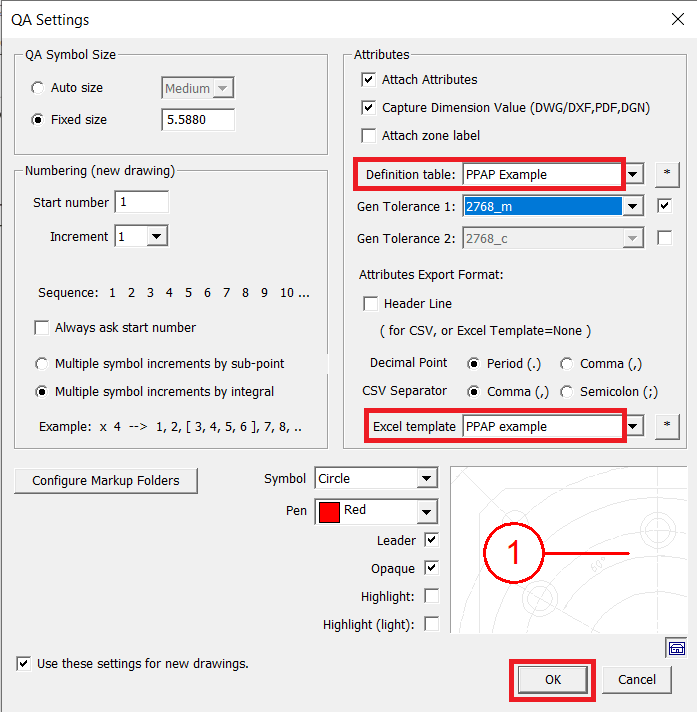 If you would like to use your customized PPAP form on QA-CAD, please click here to see this tutorial web page. 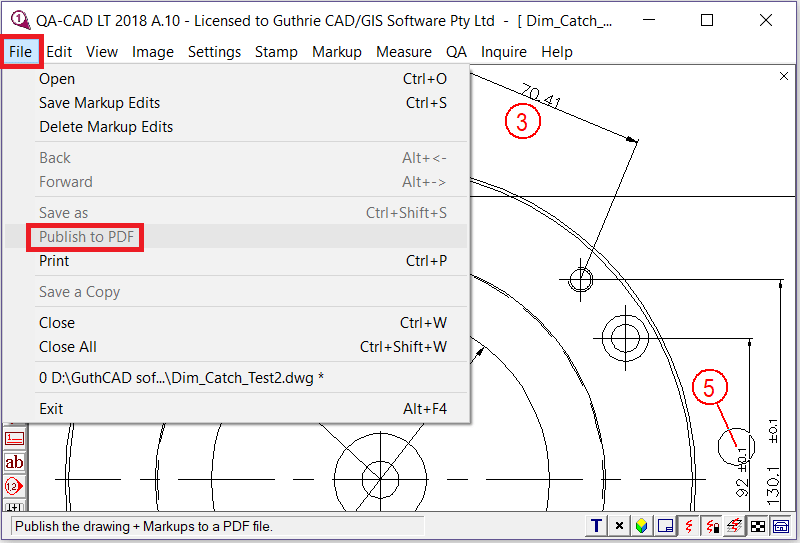 Step 2: Select your PDF drawing file (or CAD file). Press OK. If you want to see the drawing with black lines on a white background. Press three toggle buttons at the bottom-right of the software window (as you can see three red rectangles in the below example image). If not, please skip this step. Step 4: A QA settings window opens. Click * button (the red rectangle in the below example image). 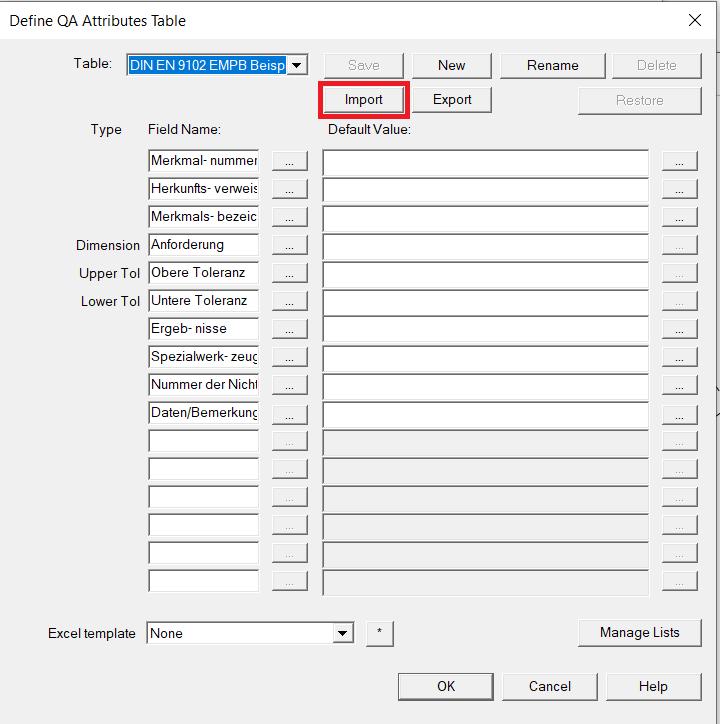 Step 5: Define QA Attributes Table window opens. Press Import button. Step 6: Click here and download 'PPAP-Example.zip' file into your PC. Step 7: Uncompress 'PPAP example.zip' file. 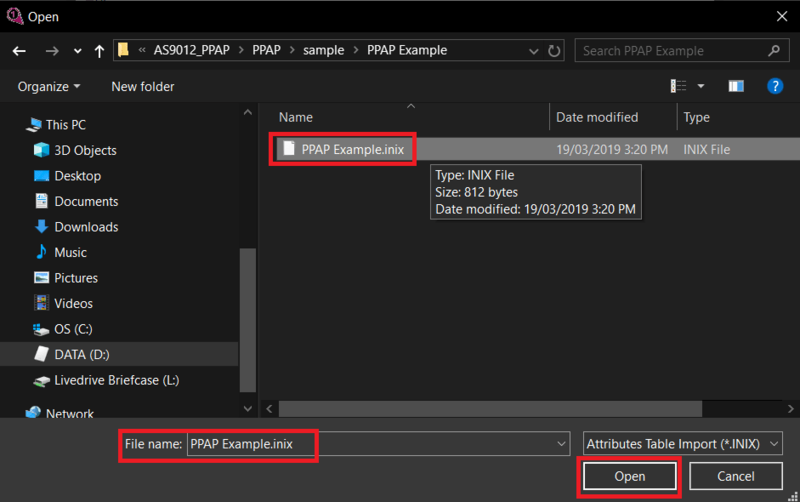 Now you have PPAP Example.inix and PPAP-Sample-Forms-2019.xls. Please keep these files in a same folder. 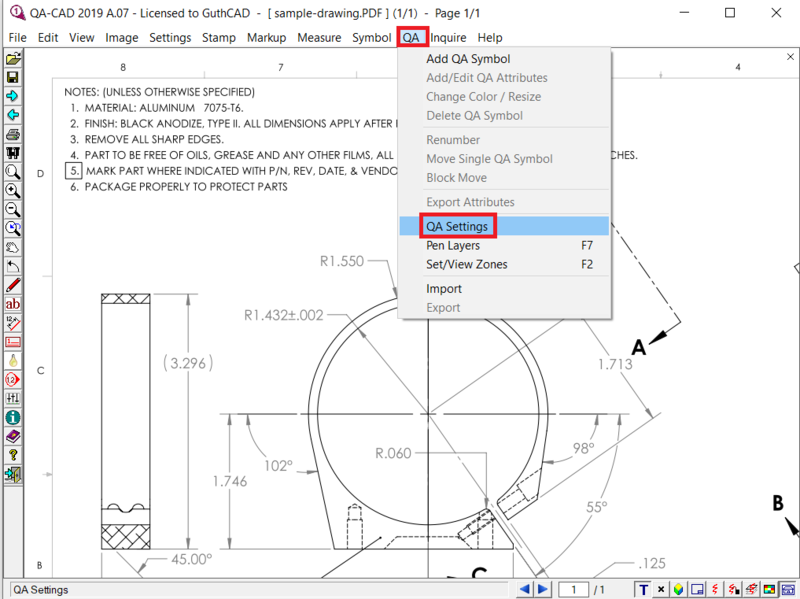 Step 8: Go back to QA-CAD. Select 'PPAP Example.inix' file and Press OK. 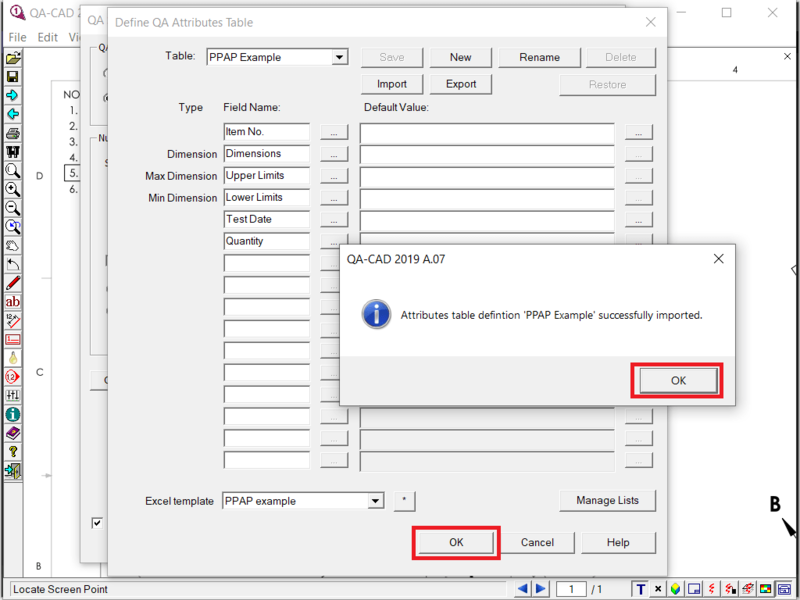 Step 9: 'Attributes table definition PPAP Example successfully imported' displayed and press OK. Then press OK on Defined QA Attributes Table window. Step 10: Going back to QA settings window. 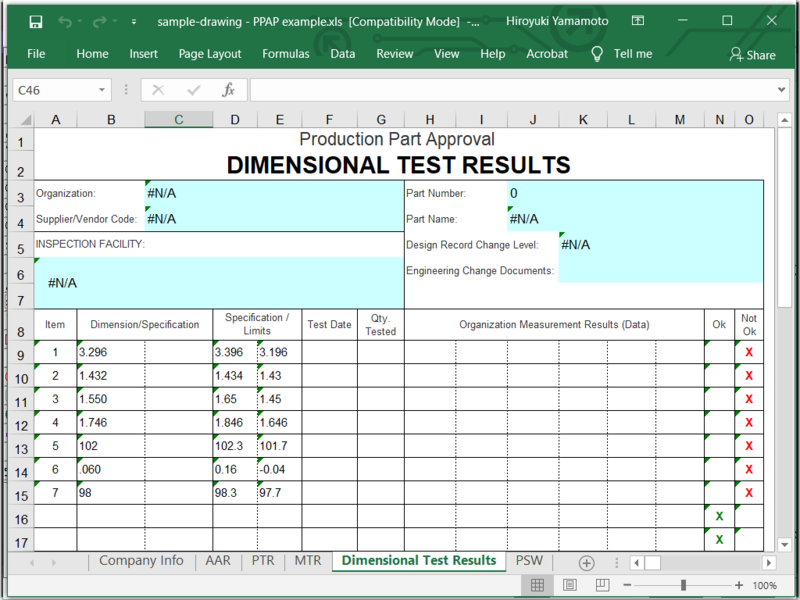 Select 'PPAP example' at both Definition table and EXCEL template. Then Press OK. Step 11: Select QA > Add QA symbol. 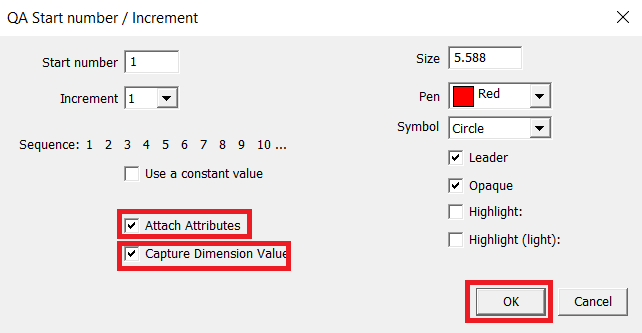 Step 12: Tick Attach Attributes and Capture Dimension Value. Press OK button.. Step 13: Your mouse pointer changes and looks like a circle with a plus sign on the software (as you can see the circle inside the red rectangle in the below image). In this mode, you can draw balloons on the drawing. Move the circle to where you would like to place a balloon and left-click once. Step 15: Repeat from 14 to 15 until you finish placing all balloons. Step 16: Select QA > Export Attributes. 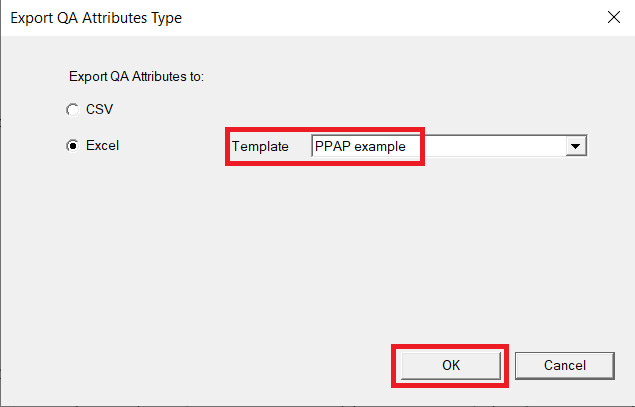 Step 17: Choose EXCEL and Template 'PPAP example' and Press OK button. Step 18: Type your EXCEL file name and press Save button. QA-CAD asks 'Would you like to view the saved file? ', then press Yes button. Step 19: EXCEL file with your captured attributes will be open on your EXCEL or spreadsheet software. 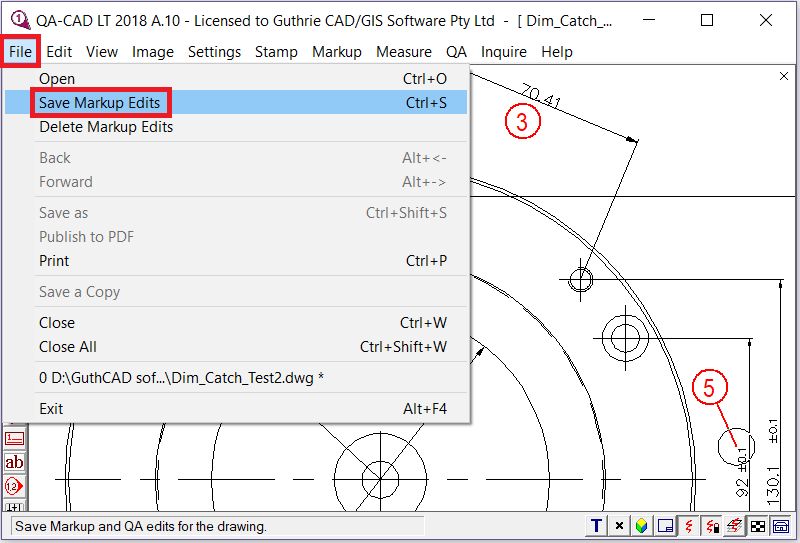 Step 20: Select File > Save Markup Edits to save the work ballooned drawing (This operation generates a CVM file which stores all overlaid balloons and markup information. The original drawing is untouched). 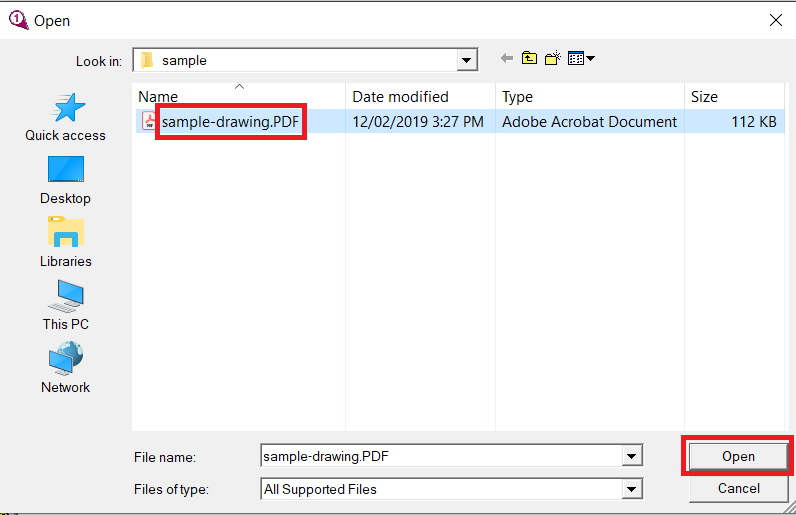 Step 21: Select File > Publish to PDF to save the delivery ballooned drawing. © Guthrie CAD/GIS Software Pty Ltd.